Last month I introduced as many new games from the overseas market as could be jammed into one article. But they keep on coming! Frankly, there seems to be no end to overseas software. So here's the ground rules: I'll try to mention new products as fast as they appear, which means that sometimes the information will be a bit skimpy. To be fair, I'll go into more depth on the most interesting ones later. Many of these programs will eventually make it to our shores, although there's no telling when or under what name. Superman—Man of Steel was mentioned briefly last time and merits a closer look. As noted before, you play the guy in tights throughout a number of arcade scenarios, in pursuit of the evil Darkseid and the equally menacing Lex Luthor. Each sequence is preceded by a comic-book page that displays text on what dire event is in progress. You begin by trying to stop Darkseid's demons from approaching the city. As they close in, you choose various powers with a click of the right mouse button. Punch a demon out of his rocket sled with a resounding thud, or use heat vision to fry his brains. Of course, these guys are firing deadly rays at you—rays you must avoid as you fly amidst them. Each power that is activated can be drained, so you need to watch the screen and monitor your power levels. You begin by trying to stop Darkseid's demons from approaching the city. As they close in, you choose various powers with a click of the right mouse button. Now to rescue Lois from the guys in power suits. This time you also have a super kick, useful when the baddy gets close enough. Beware those deadly missiles, and whack them into oblivion. Should you succeed here, you are then given the envious (?) task of escorting a space shuttle through space. Most of the meteors can be smashed or blocked with your super body, but beware the kryptonite. Fail and you are treated to the sight of the shuttle exploding. There are scenarios not described here in which you must compete before finally reaching the arch criminals. I do have a few complaints about this generally fun game. Characters are a bit tiny and Supe's movements a tad slow in response to the mouse. I also found the sound effects below par—mostly thuds and krinks. We all know that the ST sound chip is not fantastic, but it can do much better than what is found here. Some games are designed for rapid action, without a lot of strategy and thinking involved. Such a game is Andes Attack, by Llamasoft Ltd. 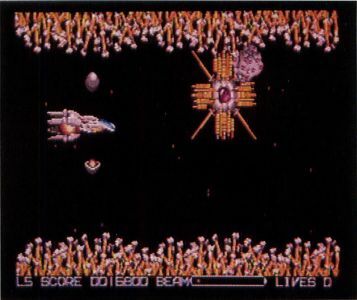 The theme is Defender-like, with you piloting your fighting ship through hostile, horizontal-scrolling terrain. Your mission: to rescue desperate llamas from the mean, ugly aliens. 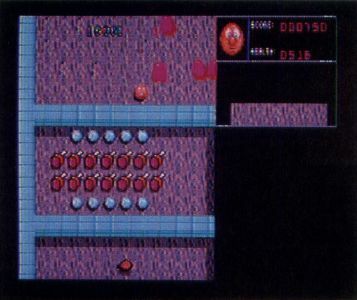 Squads of monsters inhabit each level. 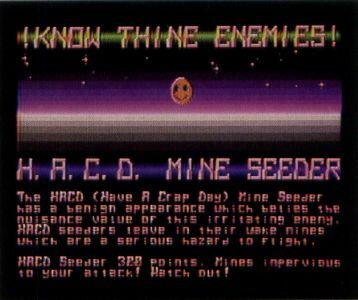 There are demonic smiley faces, floating mines, evil clutching fiends out to grab and devour those little guys, and well...you get the idea. 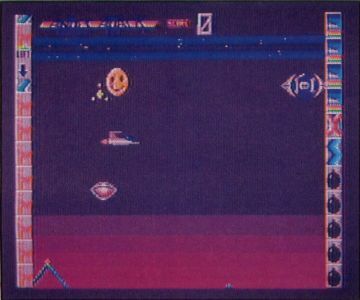 Of course, you're equipped to handle such difficulties, with rapid laser fire and smart bombs that blast a full screen to bits. Use the radar screen to keep check on the llamas, who scream for help (with ever so tiny word balloons). Manage to shred their captors before they rise up, and you can catch and return the llamas to their blessed terrain. Those in need of practice will adore the training mode, which lets you practice to your heart's content with total invulnerability. What makes this game so addictive is the graphics and ease of control. The graphics are bright, cute and big, with a cartoon feeling that adds some humor to what is, after all, a shoot 'em up. 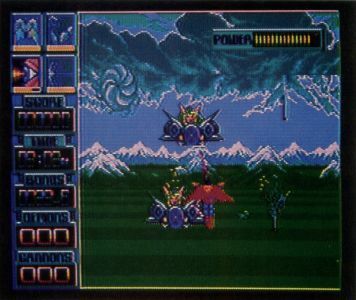 (Check out the information screens that precede play for specifications on the enemy.) 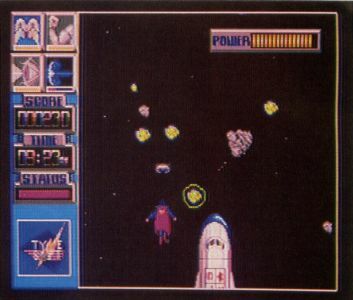 As for game control, one hand stays on the mouse to move the ship up and down, while the left button accelerates the ship and the right changes its direction. The other hand meanwhile works the Shift and Control key for laser fire and smart bombs. Once you get cooking—zipping through orange and yellow explosions, while the sound effects bleep and blap—you'll feel like you're watching a psychedelic movie. It's fun! Speaking of psychedelics, Llamasoft's Trip-A-Tron is one involved program—but that doesn't mean it's difficult to master. 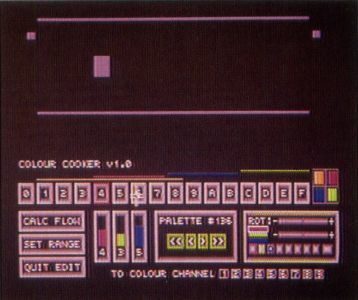 You use the various screens to create moving graphics and light patterns that dance around onscreen to your favorite music. 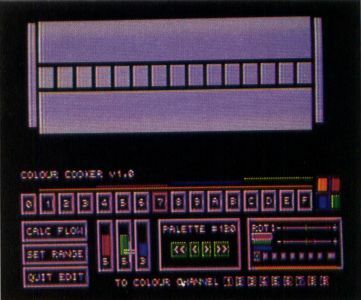 There are numerous icon-driven control screens, and these include a waveform/ build control, a star-field control, a color cooker, MIDI control and much more. Llamasoft gives you enormous options so that the final result is a personal, interactive statement between you and the music. ANDES ATTACK · Llamasoft Ltd.
More options include a video sequencer that enables graphics and music tracks to be transferred to videotape, an event assign (to make certain keys on the computer bring up desired reactions), and a sillyscope for altering waveform patterns in a purely visual way. Trip-A-Tron requires one megabyte of memory to be most effective, and it beats the heck out of the light organs of the '60s. The visual artist in you will love it. Ubi-Soft of France takes parts of Pac-Man and combines them liberally with Gauntlet to get Puffy's Saga. You control a little bouncing puff ball in search of his mate, bouncing through levels to pick up useful objects like invisibility and super shots. 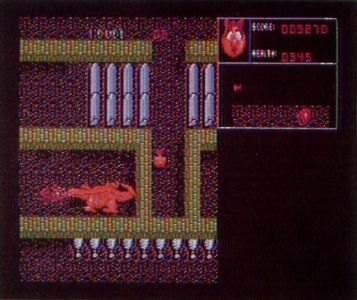 There are also the Magic Goms, which can be used to activate a map of the present level or increase your fire-power. In the meantime, there are many obstacles, not the least of which are the red blobs that won't leave you alone—even when you blast them apart. The fire breathing dragons don't help either, nor does the fact that time limits are imposed on your stay in each level. You won't appreciate the stun barriers or shape changing walls either. Extra features have been included. 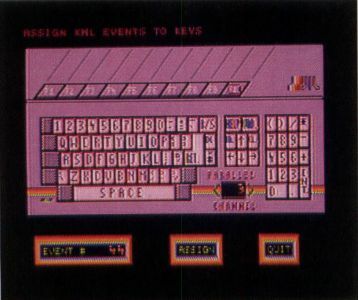 Both a slow and fast mode can be activated, and the game can be saved once you reach the seventh level. Digitized sound enhances the game, but as lowering power points bring you closer to your demise, a voice warns, "Puffy, you will die!" A bit weird for my taste. Still, all contributes to an entertaining game that requires arcade skill as well as strategy. We return to space with R-Type. The evil Bedo empire needs to be eradicated, so grab your spaceship and head on out. All the awesome action that marked the arcade version is here: giant creatures, numerous aliens and action, action, action. Fire till your joystick button overheats because there's no time to relax! Pick up power modules to add firepower and shield strength. Avoid alien weapons and the energy-draining landscape, but most of all keep firing. There's also a power orb robot that will fly alongside and help you. Be on the lookout for it. There are plenty of levels and few options but to fight it out. You do have a choice between music and sound effects, and a pause key is mercifully tossed in. 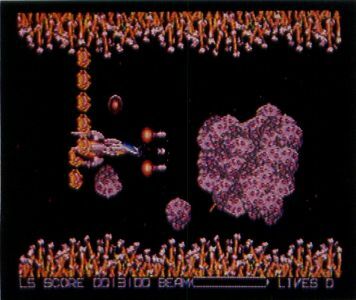 R-Type is so sensational that I feel compelled to enclose the following super cheat, but don't read further if you want to be victorious on your own merit. Here it is: When the program prompts for the second disk, first press the Help key, then type ME and press the Up arrow. Insert Disk 2 and continue. The F5 key will now protect you from the aliens and landscape, while F6 deactivates the effect of enemy fire. Just crossing my desk is another super-hero: Batman. The Caped Crusader descends upon us, courtesy of Ocean Software. Being a "night person" takes on a whole new meaning as you don the persona of this complex and somewhat violent defender of the good, in search of both the Penguin and the malevolent clown prince of evil, the Joker. More on this great game next time. Marshal M. Rosenthal is a photographer and writer whose work takes him throughout the world. 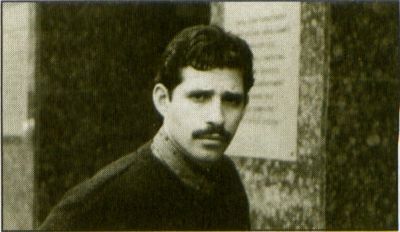 His photographic/written projects have been published in major consumer publications in Europe and the United States.